In 2009, Susannah Cahalan was 24 years old and well into an exciting and successful career as a journalist at the New York Post. And then she noticed what looked like a bug bite on her arm. That was followed by a searing pain in her head. A few days later, for no reason at all, she was tearing apart her boyfriend’s apartment, looking for evidence that he was still hung up on his ex-girlfriend. On top of that, she was feeling pins and needles in her arm that wouldn’t go away. Every doctor she saw had a different answer. She was drinking too much. It may be a side effect of her new birth control. Maybe it was mono. She suspected it was bipolar. More drugs, more tests, no answers. Soon, she’d lost the ability to concentrate and her paranoia was through the roof. Then there were the seizures. Those led to hospitalization in an epilepsy ward, where her basic motor functions started to rapidly decline. Doctors remained stumped. Cahalan herself has very little memory of what happened to her in the hospital, so she had to approach this memoir as a journalist investigating someone else’s story. She interviewed family, friends, and doctors; looked at her medical records, including video of herself in the hospital; and examined journals she and others kept during that time. By doing so, she was able to put together a gripping narrative of her mysterious illness and the challenge of finding a cure. It’s hard, I think, to really understand how much our mind is governed by our bodies. It’s not some separate organ, invulnerable to harm. 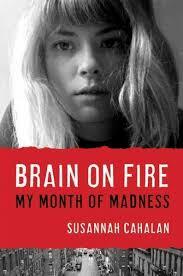 Cahalan’s illness was due to an auto-immune disease called anti-NMDA receptor encephalitis. That disease caused her brain to play tricks on her, making her hear voices and believe things that weren’t true and made no sense. It also changed the way her body and brain interact, making it impossible for her to control her body. That by itself is unsettling, but even more unsettling is how easily she could have been misdiagnosed. So many of Cahalan’s symptoms could have been attributed to something else. It was the combination, along with her unresponsiveness to treatment, that led to the right diagnosis. She was lucky, as she acknowledges, to have a team that was willing and able to keep digging. Not everyone is so lucky. And her disease has only recently been discovered. She notes that there are accounts of people from the past with similar symptoms. How long has the disease been around, undiscovered and untreated? And how many doctors still don’t know about it? It’s a rare disease, so it’s not something I’d expect most people, even doctors, to know about. But it’s still scary to think about how easily our bodies and minds can fail us and how challenging it is to find the answers when they’re anything outside the norm. I had a knee replacement almost two weeks ago and my brain is still not working the way it did before. I think background pain fogs it. I think you’re right that pain can cause brain fog. I’ve had to deal with a chronic pain condition in the past (not so much now), and I couldn’t think when I was having serious pain. As Jeanne points out, even quite common things that we know quite a lot about can be baffling to diagnose and treat. Our bodies are so mysterious, and our brains are just simply black holes as far as I can tell. This poor woman, it sounds just ghastly. True, especially when there’s a whole cluster of symptoms, and it’s hard to pin down which one is the real key, as was the case here. A doctor had her do a simple and well-known drawing test–it sounded like it was almost on impulse–and that ended up being the key. The good news is that she was aware that there was a problem pretty early on. It was just that she and her doctors didn’t recognize how serious it was going to get. I read this a few years back and found it both fascinating and horrifying. It is! It’s like House, but in book form and from the patient’s point of view. Ack! Too scary for me. (Semi-hypochondriac here.) It does sound like a fascinating read though. Initally after I finished this, I was getting nervous about every itch I had. So yeah, potentially scary if you’re a hypochondriac. I have this on my to-read list. It is apparently one of the most-read books from my to-read list (according to Goodreads). The misdirection in diagnosis reminds me of reading Karen Armstrong’s The Spiral Staircase and how long her epilepsy went misdiagnosed (for years) and was labeled as a psychological problem instead of a medical problem. Yes, I loved Armstrong’s book and was so sad for her and how long it took. In this case, epilepsy was one of the things they considered. It really helped that there were people saying there’s something physically wrong and that it started so suddenly so the disconnect from normalcy was obvious.